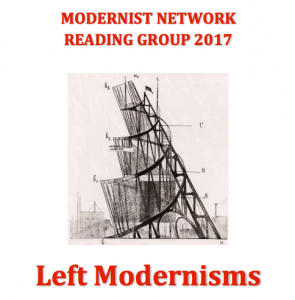 In 2017, the Modernist Network (formerly the Centre for Modernism Studies in Australia) will be hosting a year-long reading group dedicated to the idea of Left Modernisms at UNSW. Our goals will be to map some of the distinct revolutionary currents surging through modernism; to collectively reimagine modernism as the cultural impress left by a multi-dimensional politics of anti-capitalism; and to affirm as modernism a canon of artworks, ideas, events, and experiences with which to envisage another, better modernity. We propose to meet every three weeks (or thereabouts) on Thursday afternoons, from 3pm until 4.30pm, beginning late March and running until the end of October. In October, we will mark the Centenary of the Russian Revolution by holding a symposium on the topic of Left Modernisms, with the objective of publishing the papers as a special dossier with a journal or as an edited collection. Postgraduate and Honours students are especially encouraged to attend. Please follow the link below to view a flyer and draft schedule, and contact Mark Steven (m.steven@unsw.edu.au) if you are interested in attending.